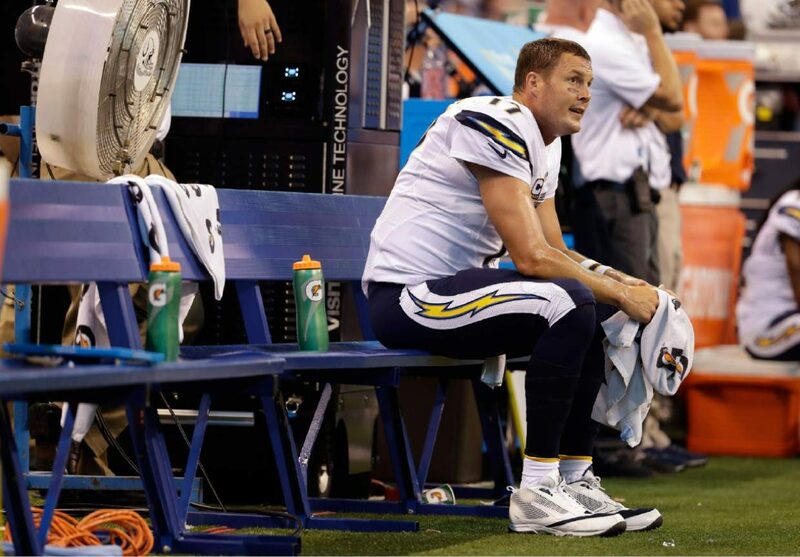 SAN DIEGO — Ever the optimist, Philip Rivers has chosen to laugh to keep from crying as the pratfalls pile up for the San Diego Chargers, although he did seem misty-eyed as he tried to explain a particularly brutal collapse against New Orleans two weeks ago. Is there more pain in store for the Chargers, who have led at halftime in all five games and at the two-minute warning in their first four games, and have scored at least 31 points three times, yet are 1-4? If so, it will be on display for a national TV audience when the Chargers host the five-time AFC West champion Denver Broncos (4-1) Thursday night. Rivers sure hopes not, although he knows the Chargers aren’t trying to fumble, throw interceptions, miss tackles and otherwise botch games. “It’s the mental challenge, really, now,” Rivers said. “Are we going to find a way to win, or are we going to find a new way” to lose? The Chargers blew late leads in losses at Kansas City and Indianapolis, and at home against the Saints. Then came last week, when another fumble by Melvin Gordon and another shank by rookie punter Drew Kaser allowed the Raiders to take the lead with almost 13 minutes to play. A botched hold by Kaser on a potential tying field goal with 2:07 left sealed the face-plant. Coach Mike McCoy’s job could be on the line, and the Chargers aren’t helping their already longshot chances of getting voters to approve a $1.1 billion public handout for a new stadium on Election Day. The defending Super Bowl champion Broncos have problems of their own. Coach Gary Kubiak was ordered by doctors to sit this one out because of a migraine condition that mimics strokes. Special teams coordinator Joe DeCamillis was named acting head coach for this game. Trevor Siemian is expected to return as quarterback for Denver after rookie Paxton Lynch struggled in a loss to the Falcons. QB QUANDARY: Siemian, who bruised his left A.C. joint in Denver’s 27-7 win at Tampa Bay, was expected to get the starting nod against Atlanta, but the Broncos deemed he wasn’t ready and went with rookie Paxton Lynch instead. Lynch was the one who showed he wasn’t ready. His poor footwork cost him a touchdown throw to a wide open Emmanuel Sanders and he constantly held onto the ball too long. It didn’t help that RG Ty Sambrailo was a turnstile, allowing three sacks before being benched. Siemian is expected to return to the starting role. SATISFIED QB: Some pundits have suggested the Chargers should trade Rivers rather than continuing to waste his career. Rivers disagrees, saying he’s been blessed to play in San Diego and raise his family here. “There doesn’t need to be any sympathy for me,” said Rivers, who led the Chargers to the playoffs in his first four years as a starter. If form holds, San Diego will miss the playoffs for the sixth time in the past seven seasons.